Since the enactment of the Commemorative Works Act (CWA) in 1986, Congress has authorized 35 commemorative works to be placed in the District of Columbia or its environs. Nineteen of these works have been completed and dedicated. The CRS report included in this book contains a catalog of the 19 authorized works that have been completed and dedicated since 1986. It also provides a status update on 12 in-progress memorials and 4 memorials with lapsed authorizations. In the next chapter, commemorative coins (which can be divided into two eras – historical coins and modern coins), are discussed. Overall, 144 commemorative coins have been minted since 1892. Since 1982, when Congress reinstituted the commemorative program, 84 commemorative coins have been authorized. Since 1998, only two coins may be authorized for any given year. To date. Congress has authorized commemorative coins to be issued through 2019. Finally, this book summarizes the different types of commemorative time periods – federal holidays; patriotic and national observances; and commemorative days, weeks and months. Second, it discusses the current rules in the House and Senate that govern this type of legislations. 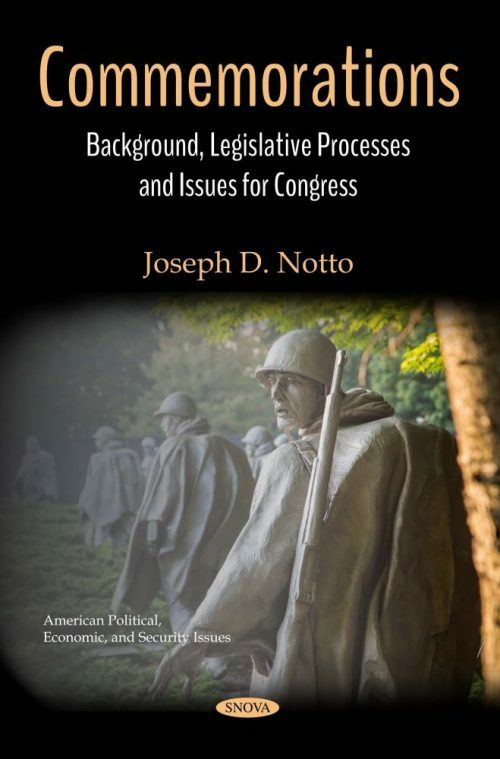 Lastly, the last chapter discusses options for Congress, including introducing legislation in the House and Senate, and asking the president to issue a proclamation.